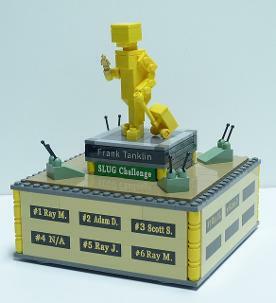 This page is dedicated to recognizing the achievements of individuals from the Saskatchewan LEGO Users Group and the group as a whole. The Chris Workman Memorial Cup is awarded to the winner of the S.L.U.G. Challenge. We hold this contest 3 times a year at various shows across the province! 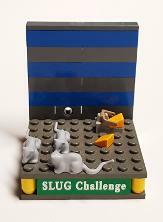 Each member of SLUG is encouraged to build for the challenge, which changes each time it is hosted. The challenge builds are put on display for the visiting public to vote upon. The winner is also awarded a keeper trophy, custom made for each challenge (at right). The Chris Workman Memorial Cup replaced the S.L.U.G. cup (below) that was introduced with the challenges began. Challenge: Builders were given the theme of 'Three" as the basis for their creations. These builds would be shown at three events to be voted on by three sets of public visitors. Challenge: Use that pause button SLUGgers! Members were challenged to recreate a scene from a video game! This was voted on at the Comic Expo in Saskatoon! 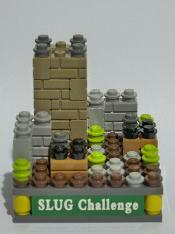 Challenge: Create something you could eat, at a one-to-one scale, out of bricks! To be shown and voted on at the Regina Model Train Show! Challenge: Build a pair of characters from Pop Culture in the style of LEGO's new brick-built characters Brickheadz! Presented and voted on at the Saskatoon Comic Expo! Challenge: Build a creation to celebrate our country's 150th Anniversary of Confederation! Them and size is left up to the builder. To be displayed and voted on at BRICKSPO! Challenge: Build a creation that, when hooked up to a LEGO motor, will move! Displayed at the Prairie Rail Workshop Model Train Show in Saskatoon. Challenge: Build a playable 'set' of around 200 pieces based on a Canadian theme. Displayed at the Saskatoon Comic Expo. 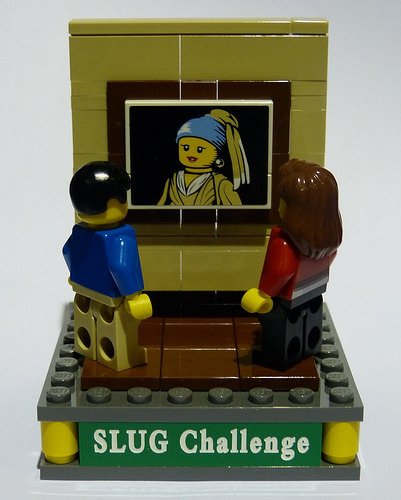 Challenge: Find a real-world object and recreate it in a 1:1 scale in LEGO. Displayed and voted on at BRICKSPO 2016 in Moose Jaw. 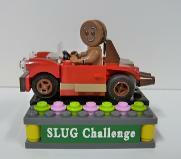 Challenge: Choose a vehicle from the Star Wars universe and build it using a LEGO theme (ex: Castle, Friends, CHIMA)! Displayed and voted on at the Prairie Rail Workshops Model Train Show in Saskatoon. Challenge: Choose an official LEGO set (less than 300 pieces) and Monsterfy it! Displayed and voted on at the RPL Geek Summit. Challenge: Build a creation of any size or theme using only two kinds of LEGO element (ex. 2x4 bricks and 1x2 bricks). Displayed and voted on at BRICKSPO 2015. Challenge: Recreate a Hot Wheels car, any scale necessary, out of LEGO Bricks! To be displayed at the 2015 Prairie Rail Workshop Train Show in Sasaktoon. Challenge: Build a creation showcasing two opposing ideas to be dislayed at the 2014 Regina Model Train Show. Challenge: Build a creation of something that would be hung on a wall. 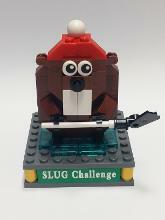 This challenge was created for BRICKSPO 2014. 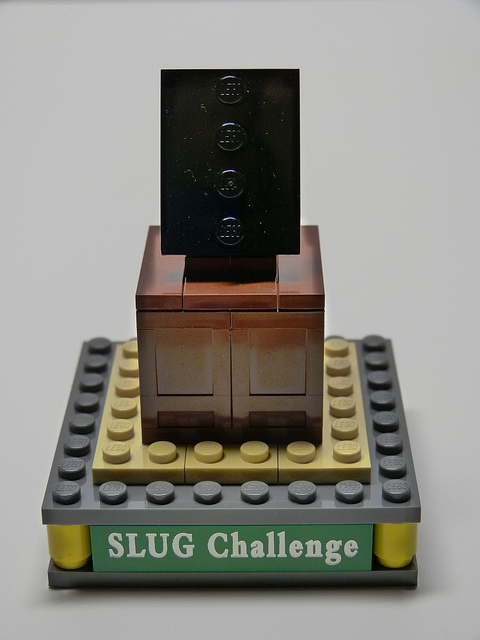 Challenge: Build a creation of any theme featuring the Collectible Minifigure Base. These were shown at the 2014 Saskatoon Model Train Show. Challenge: Create a vehicle for the layout of the 2013 Regina Model Train Show based on one of the 16 Series 11 Collectable Minifigures. 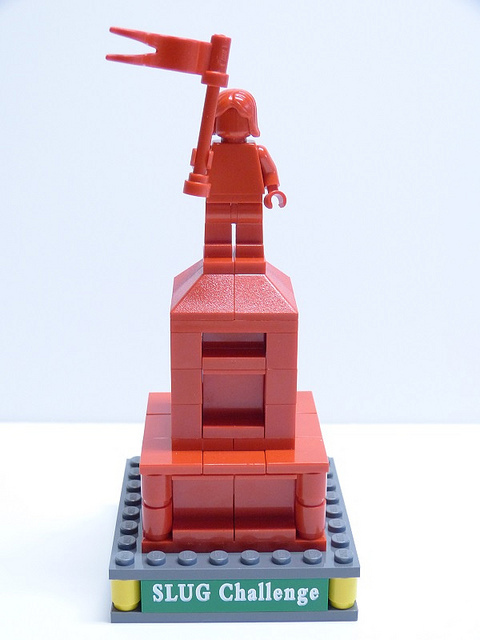 Challenge: At BRICKSPO 2013, create an awesome creation using only one colour of Lego elements. Base must not exceed 32x32 studs. Challenge: At the Saskatoon Train Show, build an awesome creation using only the pieces from set 70004, Wakz's Pack Tracker. 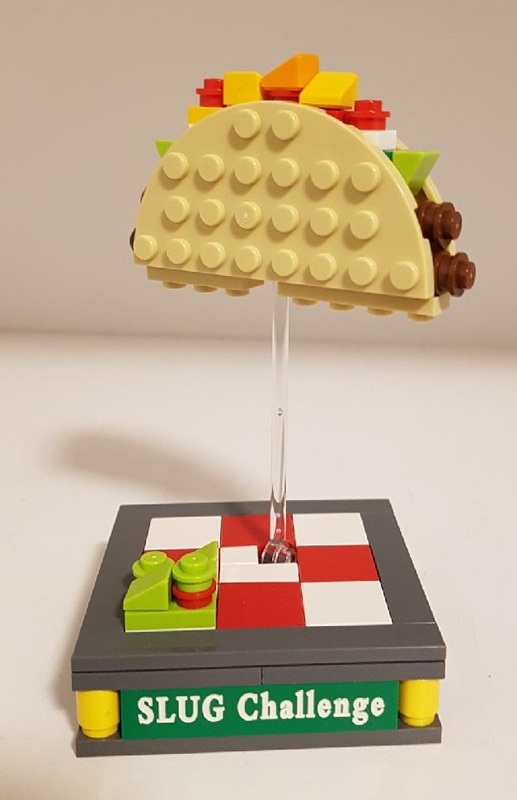 Challenge: Use a Lego brick separator in a minifigure-less creation of any size or theme. Due to the cancellation of the 2012 Regina Model Train Show this challenge was not able to be voted upon, so no winner could be declared. 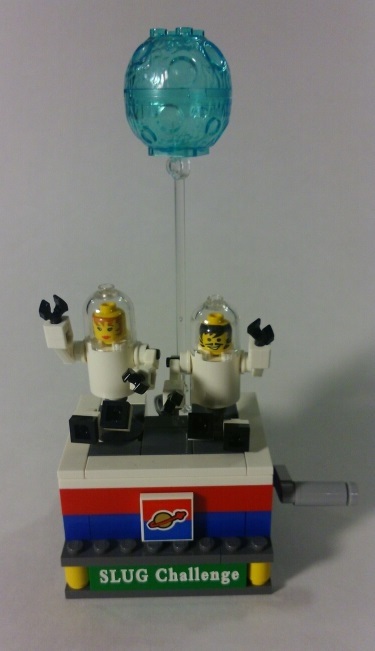 Challenge: At BRICKSPO, create a 'home' for any one of the 112 Collectable Minifigures, built on a 32x32 baseplate. Challenge: Create a 16x16 stud vignette for the 2011 Regina Model Train Show based on one of the 16 Series 5 Collectable Minifigures. 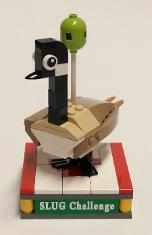 Challenge: Build a parade float for the 2011 Moose Jaw Train Show using one of the four 2010 'Bricktober' minifigs. we are eligible to win show awards. Below are a few of the awards we have been honoured to receive. There are a number of different LEGO conventions held arcoss the continent and around the world! 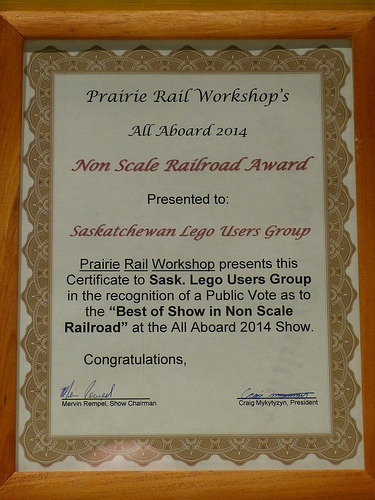 From time-to-time, members of the Saskatchewan LEGO Users Group are fortunate enough to attend these shows, and even more fortunate to win awards at these events! Below is a chronological listing of events members have attended, and the accolades they have received there.